We've been on more of a clean eating kick now that summer is over--- however, boring food is not my thing so I try to incorporate lots of flavours, textures and veggies into what I'm doing. 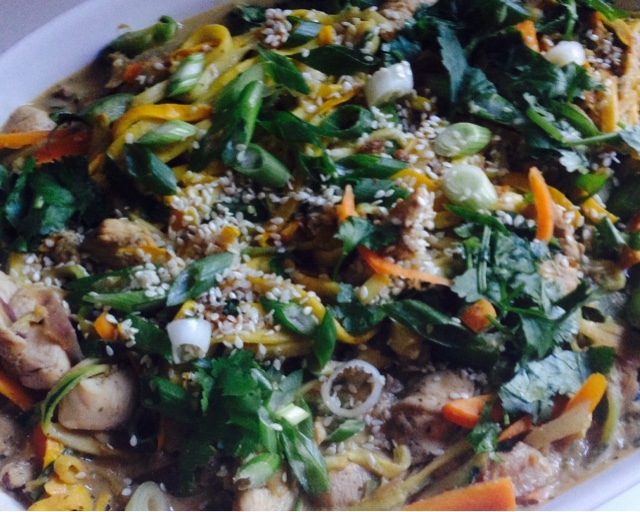 Enter Asian inspired zoodles! 1- Cut zucchini into strips or spirals. I have a veggetti but you can use a spiraliser or even a mandolin or cut into tiny strips yourself. Set aside. 3- Place 1 tbsp of oil in pan and when hot, throw the onion mixture. 5- Add the veggies except for the zoodles. 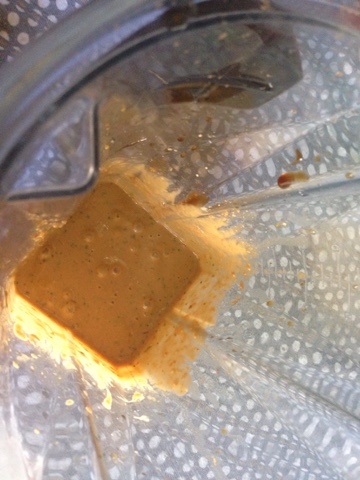 6- Add peanut sauce, tablespoon by tablespoon as necessary until saucy--- yeah, that's right. Saucy. 7- Either remove from pan or in a separate pan, heat oil and throw in zoodles. 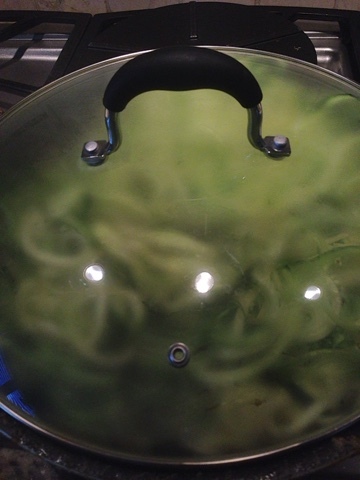 Cover pan to simmer for two to three minutes until steamed . 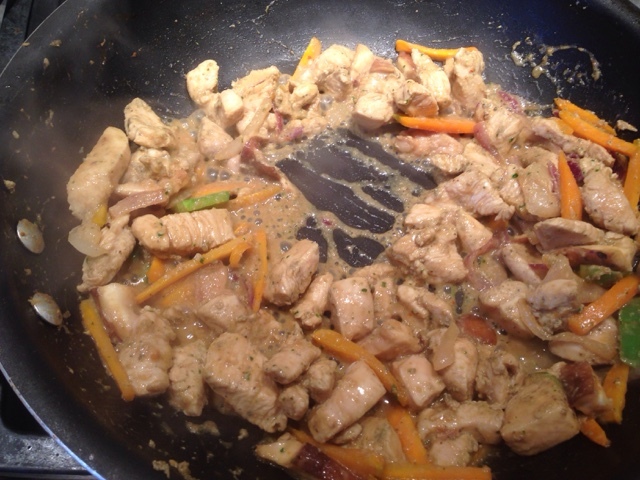 Add chicken mixture until well combined. Add more sauce if you wish. 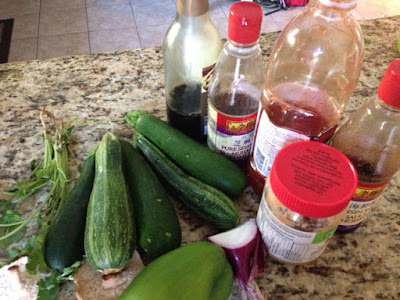 The zoodles do give off some liquid! 8- Top with cilantro, green onions and sesame seeds… if you wish. Also, there's a bit extra peanut sauce but it can be used as a dipping sauce or I just mixed it in with some regular pasta for my kids. 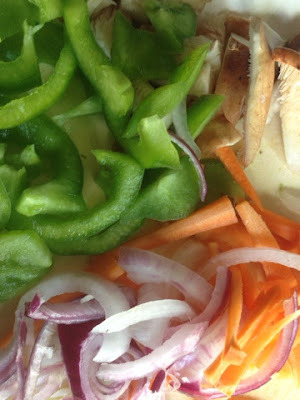 This recipe was seriously so, so flavourful and yummy! I used a spoon to scoop up the extra sauce from my plate. It would go well with shrimp or tofu also. I can't wait for when it's on the rotation again! YUM! That looks so good!! 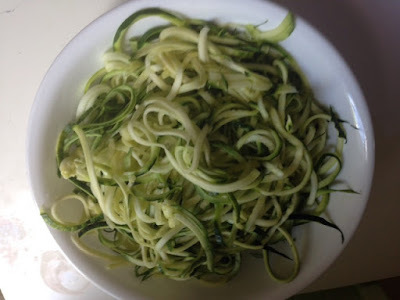 I bought a spiralizer for the first time this summer and love "zoodles" - definitely will try this. I love zucchini noodles, this looks delicious! I bet this tastes amazing with the peanut flavor. I will have to give it a try! Thanks for sharing! Prepare it for your parents when we come next wk; we will like to taste it. By the big kisses to our granddaughters.